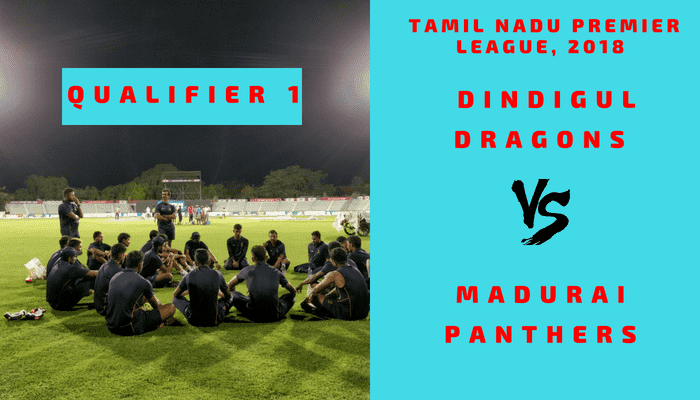 Dindigul Dragons is all set to take on Madurai Panthers in Qualifier 1 on Thursday, August 09, 2018. DIN and MAD finished in the first and second position with ten points each. In Today’s Dream11 Match Cricket Match Prediction of DIN vs MAD Qualifier 1, TNPL 2018, we will cover Pitch Report of Indian Cement Company Ground, Tirunelveli, Probable Playing 11, Toss Prediction, Fantasy Cricket Tips/News and Who Will Win? Who Will Win the 1st Qualifier T20 Match, Between DIN vs MAD and Toss Prediction? Where Can You Watch the Live Streaming of DIN vs MAD, Qualifier 1 or Channels to Watch? Dindigul Dragons and Madurai Panthers, both the teams have finished in the top position in the league stage. Both the teams have won 5 matches and lost two games. Both the teams have an equal chance of winning. According to our astrology prediction, MAD will win the match today. The team winning the toss should opt to bowl first as chasing is comparatively easy on this ground. According to our astrology prediction, MAD will win the toss and ask DIN to bat first. Date: The match will be played on the 9th of August 2018 (Thursday). Match: Tamil Nadu Premier League, 2018, DDD vs Madurai, Qualifier 1. Venue: Tirunelveli, Indian Cement Company Ground. Time: 1:45 PM GMT, 07:15 PM IST, 07:15 PM Local. Scoring runs in the first half of the game will not be that easy. The seamers will get swing and movement in the first couple of overs. The batsman can score good runs if they managed to handle the initial swing. The spinners will also come into the game in the middle overs. Overall the pitch will assist all the three departments. The one who will bend their back the most will be benefited the most. Note: If you know how the pitch will play, then you can select your team according to the pitch. Make use of the pitch while selecting your team for fantasy leagues. From the above pitch report, you would have understood that making a team with a combination of all three departments would be a wise choice. It is expected to be partly cloudy throughout the day. It will be mostly sunny in the second half of the day. The cricket fans and fantasy users can see the complete game as no rain is predicted. It will be a hot and humid day. The temperature is expected to be 30-Degree Celsius and the humidity to be 56%, which may go up to 70%. Note: The weather condition will favour the batsman. If you are a Siechem Madurai Panthers fan, the statistics may make you unhappy. MAD and DIN have played three matches against each other and MAD have to register a single win. In the last encounter, DIN defeated MAD by 9 wickets with 28 balls remaining. Note: If you have the record and statistics of previous matches. You can make a fair idea that about the winning team. The TNPL will be broadcasted in Tamil and English language by Star Sports. India: Star Sports 1, Star Sports 2, Star Sports HD1, Star Sports HD2, Star Sports Tamil, Hotstar. N Jagadeesan, Hari Nishanth, and R Vivek are the key performers of Dindigul Dragons Team. Ravichandran Ashwin is on national duty, so he will not play. Hanuma Vihari and Arpit Vasavada will no play being outstation players. DIN is expected to play with the same playing 11. NS Chaturved, M Mohammed, ME Yazh Arun Mozhi, Balchander Anirudh, M Silambarasan, Trilok Nag, N Jagadeesan (c & wk), Hari Nishanth, R Vivek, Mohan Abhinav, Varun Totadri. R Vivek, N Jagadeesan (c & wk), Ramalingam Rohit, Hari Nishanth, Adithya Arun, NS Chaturved, Nivethan Radhakrishnan, Balchander Anirudh, N Ramakrishnan, M Mohammed, ME Yazh Arun Mozhi, Mohan Abhinav, Jagannathan Kaushik, M Silambarasan, Ra Aravind, Trilok Nag, M Sujendran, Varun Totadri. Arun Karthik, Thalaivan Sargunam, and Jagatheesan Kousik are the key players of Madurai Panthers Team. Amit Verma and Raphy Gomez will not play the match being outstation players. MAD will play with the same playing 11, although they lost their last game. Thalaivan Sargunam, Arun Karthik (wk), D Rohit, Rahil Shah, Abhishek Tanwar, R Karthikeyan, Shijit Chandran, Jagatheesan Kousik, Kiran Akash, Varun Chakravathi, SP Nathan. Thalaivan Sargunam, Arun Karthik (wk), Nilesh Subramanian, D Rohit (c), SS Karnavar, Jagatheesan Kousik, R Karthikeyan, Varun Chakravathi, PS Sivaramakrishnan, SP Nathan, Rahil Shah, Shijit Chandran, Lokesh Raj, Abhishek Tanwar, Vikram Jangid, Kiran Akash, MS Promoth, Jaganath Sinivas, Tushar Raheja. Fantasy Cricket Expert Tips: Both the players are good. You can select anyone. 51.91% of the users have selected N Jagadeesan in their Dream11 Teams and 46.83% of the users have selected Arun Karthik in their Dream Teams. Make a combination of the above players for multiple teams. This Team is for Head to Head Leagues and Small Leagues. Conclusion: This is it for Today’s Dream11 Fantasy Cricket Match Prediction of DIN vs MAD, 1st Qualifier T20 Match, which will be played on Thursday 9th August. We have covered all the details required to win any fantasy leagues. We have covered players recent and past performance, dream11 guru and crictom prediction, all the latest news and updates of Dindigul Dragons Team and Madurai Panthers Team, weather report of Tirunelveli, dream 11 best teams, keys players, the best choice for captain and vice-captain, where to watch the live match of MAD vs DIN, 1st Qualifier T20 Match and the details of live streaming of Tamil Nadu Premier League (TNPL), 2018.